Home | Good Luck – Lands End to John O Groats! Good Luck – Lands End to John O Groats! Good luck to our directors, Paul Hebden and Kevin and Jane Dawson who are, this week, embarking on the gruelling challenge of cycling the length of Britain from Lands’ End to John in support of the charity. 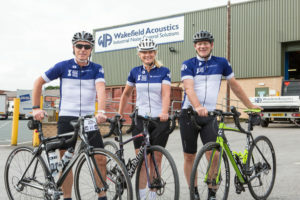 They will be riding as part of the Deloitte Ride Across Britain which see participants tackle the 969-mile ride in just nine days passing through 23 counties and with a total climb over the duration of the ride of over 48,000 feet, equivalent to 1.5 times the height of Mount Everest. Kevin and Paul are cycling the full ride while Jane joins the ride in Penrith to cycle the final 450 miles over four days through Scotland to the John O Groats. The riders will set off from camp each morning at 6 am, cycling a minimum of 100 miles a day whatever weather conditions prevail on the journey. Kevin and Jane Dawson are undertaking the challenge to raise awareness and support for mental health charity MIND, whilst Paul Hebden is riding for Woman V Cancer, a charity established in 2010 to raise funds for three female UK cancer charities: Breast Cancer Care, Ovarian Cancer Action and Jo’s Cervical Cancer Trust.